Britalba offers a range of servicing and vehicle repairs at affordable rates. Our expert staff are highly qualified and experienced, we have van and truck diagnostic equipment (TEXA) for all van and truck makes. We offer specialist services to commercial Vehicle operators such as a full truck wash which includes the underside using our purpose built ramp. MOT preparations and the availability of concrete block hire for MOT testing. 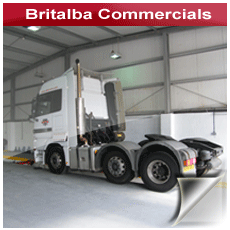 Britalba Commercials offers Diagnostics, Service and Repairs for the following truck manufacturers.